Bluestacks has been the most popular and the most successful Android emulator till now. Recently the company released a major update to its emulator in the form of Bluestacks 2. Bluestacks 2 is the improved version of the Bluestacks and comes with several new features. As of now the Bluestacks 2 is only available for Windows computer, but you can expect it to make its way to the Mac OS X soon. As the old habits don’t go away, the old Bluestacks error also is something the company cannot get rid of entirely. So, in today’s article, we will be showing you the common Bluestacks 2 errors and fixes. If you are in a hurry, check our table of contents list below and jump directly to the Bluestacks error you are facing. Bluestacks is an Android emulator and has been popular among the users who wants to run Android apps on Windows PC or Mac. It allows you to run the favourite Android apps on Windows PC. Bluestacks error, on the other hand, has been as common as the emulator itself. The Bluestacks may not be able to get rid of these Bluestacks errors as they don’t occur on every computer but depends on PC to PC. There is no single Bluestacks error; hence, it cannot be resolved with a software update. Different users face different Bluestacks error. Some of the common Bluestacks errors have been Blustacks 25000, Bluestacks stuck on the loading screen, stuck on downloading screen at 100%, Bluestacks freezing while playing Clash of Clans, Bluestacks graphic card error, Bluestacks 2GB memory error, download runtime data error, etc. Bluestacks is a heavy application and requires you to have a computer with a decent configuration according to today’s standard. A recommended configuration to run the Bluestacks is 3-4GB of RAM, a dedicated graphic card or Intel integrated graphics and a powerful enough Intel or AMD processor. If you are running Bluestacks on an old computer, then don’t run other applications alongside Bluestacks as it can slow down your computer. Here I have listed common Bluestacks errors and fixes. These fixes have been taken from the Internet according to the user feedback. Though most of these fixes should fix common Bluestacks errors, you may need to try it before coming to aaconclusion. Nevertheless, give these fixes a try and hopefully, you should be able to fix common Bluestacks errors. The common Bluestacks error mentioned below are for the old version of Bluestacks and not for Bluestacks 2. So, if you are using the old version of Bluestacks and haven’t updated to the latest version of Bluestacks then download Bluestacks 2 from the link here. If you still face any Bluestacks error then go through the fixes for common Bluestacks error below. Click on your error link below, and it will take you to the recommended fixes. Note: Before you try any of the fixes given below, try to disable your antivirus program and also disable your Antivirus Firewall temporarily. This may also cause Bluestacks error on the computer. If disabling the Antivirus and Firewall fixes the Bluestacks error, you may don’t need to follow these fixes anymore. The graphic card error in Bluestacks is the most common error faced by the user. When you try to install Bluestacks on your computer, you will get an error message “Bluestacks currently doesn’t recognise your graphic card. It is possible your graphic drivers may need to be updated, please update them and try installing again”. You would also see an error code 25000 when the graphic card error pops up. 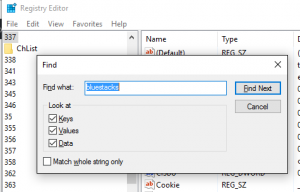 There are two methods to fix the graphics card error in Bluestacks. The first method is downloading an older version of the Bluestacks which does not require the graphic card to install and the second method is updating your graphic card drivers. If you have Intel’s integrated graphic processor or a dedicated graphic card, then you may need to update your graphic card driver to resolve this error in Bluestacks. To update your graphic card driver go to My Computer > Hardware and Sound > Device Manager > expand Display Adapters > right-click on your graphic card driver and select Update drivers. You can also get the latest version of graphic card driver for your graphics processor from the links given below. 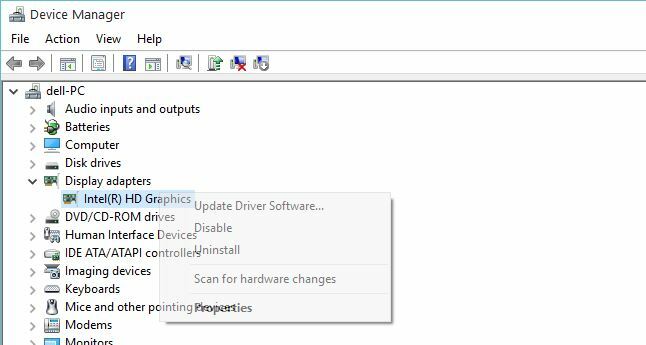 Update graphic card driver for Intel Chipset, AMD and Nvidia. After updating your graphics card driver, reinstall Bluestacks again. If you don’t have a dedicated graphic processor or integrated Intel graphics chip then you can download the older version of the Bluestacks from the link here. However, do note that if you install the older version of the Bluestacks, you won’t be able to run graphic intensive Android games on Bluestacks. But, you can run Apps like Whatsapp on PC. If you are using the online Bluestacks installer to install the Bluestacks, then you may face “Downloading runtime data error” while downloading the data. It is a common error and may occur to anyone. This error occurs due to the problem in Bluestacks server. To fix this error you have to uninstall the partially installed Bluestacks completely and then reinstall Bluestacks. Use any third-party uninstaller such as Revo uninstaller to uninstall Bluestacks. This would make sure that all the files from your directories are removed. Alternatively, you can also download the Bluestacks offline installer and solve downloading runtime data error. You can get Bluestacks offline installer from here. While trying to install the Bluestacks on your computer, you may face an error message “hmmm…. It seems BlueStacks App Player couldn’t be installed on this computer. We’d love to fix the problem – can you help us? Search for the file: C:/User/window.AppData/Local/Temp/MSIA0907.LOG and email it to us at Support Thanks!”. There are two reasons for this error. The Bluestacks app player couldn’t be installed error can occur if you have old Bluestacks installation files in your directory or if you haven’t installed the .net Frameworks on your PC. At times, while uninstalling a program, backup files will remain in your registry. This can cause Bluestacks app player couldn’t be installed error in your PC. To fix this press “Windows key + R”. Enter “Regedit” and hit enter. From the left corner pane click on “HKeyLocalMachine”. Open it and look for “Software folder”. Under “Software” folder, delete Bluestacks folder if you find it. Once done, download and install Bluestacks again. If you don’t have.Net Frameworks installed, then you may face the “Bluestacks app player couldn’t be installed error” on your PC. To resolve this error, install .Net frameworks from the official Microsoft website. This is only required if you are installing an older version of the Bluestacks. Another common problem in BlueStacks is “Failed to install BlueStacks” error. This error has no error code hence it is difficult to find the culprit of this error. However, what you can do here is look for the old Bluestacks files in your registry. At times, when you uninstall programs, Windows does not clean the files completely, and some files will remain in your registry. You can delete these files using the Registry Editor. To do this, press “Windows key + R”. Enter “Regedit” and hit enter. From the left corner pane click on “HKeyLocalMachine”. Open it and look for “Software folder”. Under “Software” folder, delete Bluestacks folder if you find it. Now download and try to install the Bluestacks from scratch. This should fix the “Failed to install Bluestacks” error on your PC. If you try to search for any app using the Bluestacks search bar, you may come across this “No app found please check your internet connection and try again” error. This is a common error and should not be a big problem. This is a common error and also a temporary error. If you come across this error, try to disconnect your internet connection. Close Bluestacks completely. Open Task manager, in the process tab, find “Bluestacks” process. If not look for the Bluestacks process in the Service tab in Task Manager. If you find any Bluestacks service running, click on it and then click on End process button. Now run the BlueStacks again and try to connect to the internet. This time, you should be able to search for the app without any error. Bluestacks initially needed the computer to have a minimum of 1GB RAM to install on your computer. Later the company increased the requirement to a minimum of 2GB RAM. Now if you are on an old computer with less than 2GB RAM, then you will see low physical memory error in Bluestacks. In such situation, you may have to upgrade your RAM or get the older version of the Bluestacks app player and install it on your PC. The error “Unknown Error Code During Application Install 110” occurs in BlueStacks when you try to install any from the Google Play Store. This usually happens because of Google Play cache. To resolve this error, you may need to clear Google Play cache. Remove your Google account from the BlueStacks. Then, enter your Google account details from scratch and fix “Unknown Error Code During Application Install 110” error. Another minor yet common Bluestacks error is “Couldn’t sign in, can’t establish a reliable connection to the server” error when you try to use Bluestack. This is a temporary error and can occur due to several reasons. The first thing you should do is make sure that you have a stable internet connection. If the error persists, do the following. Close Bluestacks. Open Task Manger and look in the “Process” tab and look for Bluestacks service. If there is any Bluestacks service running, make sure to select it and click on the End process button. Now disconnect your Internet and disable the Internet adapter. Restart your PC to save the settings. Enable your Internet adapter and connect to the Internet. Now run Bluestacks and try to Sign in to the Google Play store and see if the error has been resolved. The Bluestacks object reference not set to an instance error has been reported by so many users that this seems to a bug with the Bluestacks 2 itself. As a workaround, you can try downloading the previous version of Bluestacks and install it until Bluestacks 2 has been fixed for the bug. The Specified argument was out of the range of valid values error has been one of the most common errors in Bluestacks 2. It seems to occur because of screen resolution issue. This is a bug in Bluestacks 2, which needs to be fixed by the developers. However, as a workaround try these steps. The error Specified argument was out of the range of valid values occur when you run the Bluestacks 2, and the window width and height pulled up to the max available screen resolution of the monitor/display. There are two things you can do to fix it. 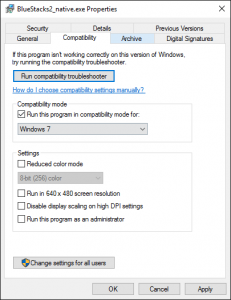 Reduce your Display Resolution to 600 x 800. To do this, right-click on Desktop and select Display Settings. Scroll down and click on Screen Resolution drop down menu and select 800 x 600 as the screen resolution. Click on Apply and save the settings. The above method should work fine, but you may not prefer it because of reduced screen resolution. In that case, you can edit the registry files related to Bluestacks and set the Width and Hight of the Bluestacks 2 window. Here is how to do it. Thanks to Chris for this fix. Note: Editing of registry files involves risk of breaking your system. To avoid this, create a restore point in Windows 10 before proceeding with the below steps. This will help you to recover in case something goes wrong. Go to the taskbar, right -the Bluestacks icon and select ‘quit’. Press Windows Key + R, and type Regedit and hit enter. It will open Registry Editor. 4. Double Click ‘Window Height’ set ‘Base’ to Decimal and set ‘Value Data’ to ‘600’. Click OK.
5. Double Click ‘Window Width’ set ‘Base’ to Decimal and set ‘Value Data’ to ‘800’. Click OK.
6. Start Bluestacks and resize the window as required. If you have been trying to install Bluestacks on your computer, you may encounter this error. Hmm… It seems Bluestack App Player couldn’t be installed on this computer. We’d love to fix the problem – can you help us? Search your Computer for the file: C:User/suser/AppData/Local/Temp/MSI579fa.LOG and email it to us at [email protected] Thanks! The error is related to ownership and certificate problem. It usually occurs when you try to install Bluestacks 2 from the offline installer. Now there are two methods to fix it. Try the first one, if that did not resolve the issue, try the method 2. In this method, you will be taking ownership of the Bluestacks installer file and then try to install it. So download the TakeOwnership.zip file from the given link. It is a Zip file, so you should extract it. Once extracted, run the file and it will add Ownership option to your right-click. A restart may be needed before the ownership option can be added to your Right-click. So, restart your PC. Now navigate to where you have the Bluestacks.msi setup file. Right-click on it and select Take Ownership. Once, double click on the Bluestacks.msi file to install Bluestacks. Navigate to the location where you have the Bluestacks.msi file located. Under Properties, go to Compatability tab. Check Run this program in Compatability mode for option and click on Apply to save the changes. Next, click on Digital Signature tab. 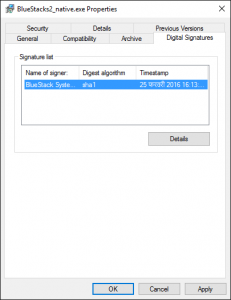 Under Signature list, select Bluestacks system and click on Details. 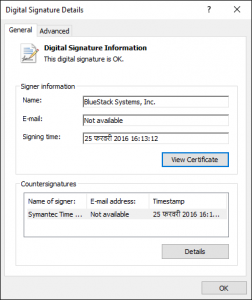 In the Digital Signature Details window, click on View Certificate. Next, click on Install Certificates. 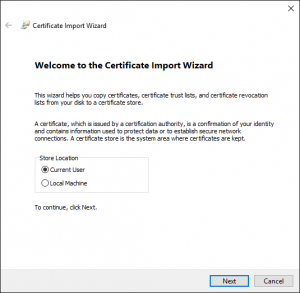 In the Certificate Import Wizard, select Current User as Import Location and click Next. Next, select “Automatically select the certificate store based on the type of certificate” and click Next. Click Finish to install the certificate. Upon the successful installation, a “The import was successful” message will be displayed. Now run the installer again, and the Bluestacks will install without any error. The Bluestacks error 2318 occurs when you try to install or uninstall Bluestacks player. The error is common, and the reason for this can be anything. This error can occur due to registry problems, malware, and virus problem, etc. Here are few quick fixes to resolve the Bluestacks Error 2318. Press Windows Key + R, type regedit and hit enter. It will open Registry Editor. Next, press Ctrl + F and type Bluestacks. You will see all the results related to Bluestacks. Delete all the registry details related to Bluestacks. Now try to install Bluestacks again, and you should have the problem resolved. While deleting the Bluestacks key if you get “Cannot delete Bluestacks: Error while deleting key” error then it could be a permission issue. Follow this article to fix cannot delete error while deleting the key. 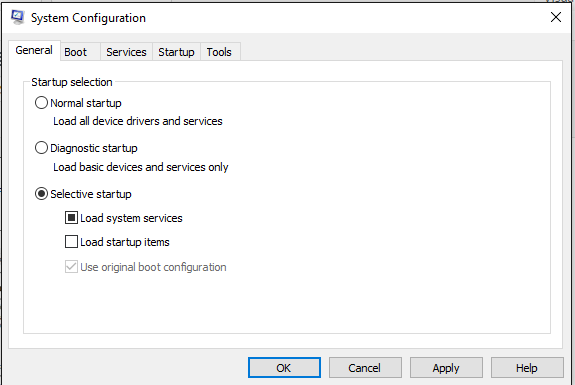 Clean Boot in Windows allows you to boot PC without third-party applications or services. So, if any of the third-party service or apps is causing such error, then you can boot into Clean Boot Mode and try installing Bluestacks. Press Windows Key + R and type msconfig in the Run dialogue box. Hit enter to open System Configuration. In the General Tab, Check Load System services and Use original boot configuration. Now click on Services tab. In Services tab, check ” Hide all Microsoft Services “. Once done, click on Disable All. This will disable all third-party services temporarily. Now restart your PC and try installing Bluestacks. If the error was occurring due to third-party service interference, then you should be able to install the app now. Note: Don’t forget to enable all the services once you are done installing the app. 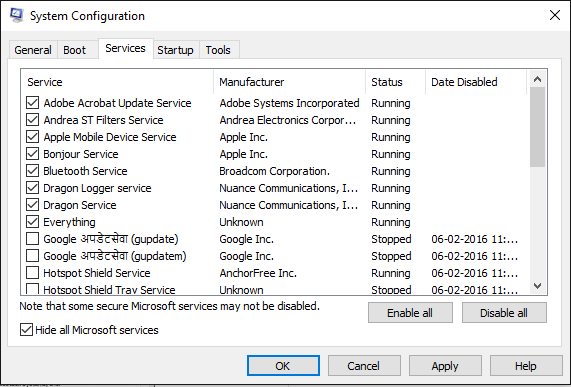 To enable services again, open System Configuration, go to Services tab, check Hide all Microsoft Services, then click on Enable all. You can also try restarting the Windows installer to resolve Bluestacks error 2318. Open Command Prompt as admin. Right-click on Windows Button / Start button and select Command Prompt (Admin). In the command prompt, type these commands one by one. Once done executing these command, try to install Bluestacks and see if the error has been resolved. Fix Failed to install Bluestacks eror. Im having trouble deleting the “bluestacks” folder in the reggidit because every time i try to delete it theres an eror “Cannot delete Bluestacks: Error while deleting key.” is there a way to so i can fix this problem? This must be a permission issue. You don’t have required permission to delete this key. Try doing this >> Right-click on the key and click “Permissions…”, then Add. Type in your username then “Check Names”. Click OK. Then Click Advanced and then the Owner tab. Highlight your username and hit OK. You should now be able to check Full Control under the Allow column and from there actually delete the key. When you start Bluestacks 2 there will be two tabs. Welcome tab and Android tab. Click on Android tab, and then open any app. If you want to open another app in another tab then again click on the Android tab and open the second app. This way you can open multiple tabs in Bluestacks. Excuse me sir.In blustacks 2,when i click on andriod tab,it says please wait,loading data,hust a moment and freezes eventually. hi., so i installed it fine but it won’t load properly. it opens but then it doesn’t go any further. all i get is a loading screen and int he “android” tab and nothing else. i have the same problem. but when i click on the ? on the bottom left, it goes to initiailizing and doesnt go any further. can u send me a video or photo steps? Abort the installation and re-try with Anti-Virus turned Off (Firewall as well) if you haven’t already. denz, i just killed the installation application and then opened bluestacks and it seems to be working fine…. Thanks for confirming the fix. Hi Stev, If you aborted the installation, before it could finish, then you may need to reinstall Bluestacks again. While reinstalling bluestacks, make sure you turn off your antivirus and the Firewall temporarily. Everything was fine during installation. My problem is while i run some android games..to be specific when i play marvel future fight at high graphics shadows and lighting ambience are not showing. What should be the reason.? hi plz help me bluestacks freezes while playing most of the games like clash of clans it just freezes and wont respond to any thing.when I click the home button it does not respond but some games like subway surf,hill climb works fine.and when it freezes and I try to restart bluestacks it tell cannot stop bluestacks.plz help me the offline installer worked fine in other laptops and pc . I even changed my windows form 8 to 8.1 and now it is running on 10 but the problem is same.the laptop is Hp pavilion g6 plz reply fast.-.waiting for your help…………………………………………..
Did you try updating to the latest version Bluestacks 2? They seem to have resolved freezing issue. What is the configuration of your laptop? Bluestacks requires a laptop with good configuration for smoother functioning. The Laptop is of Hp pavilion g6. can u help the other ways I don’t want to update it. Thank you Tashreef Shareef, I was able to fix my BlueStack MSI log issue with the registry delete resolution. Keep up the good work man! I have an issue where Bluestacks 2 starts up but doesn’t do anything after. I keep getting a pop-up saying “system upgraded, click “ok” to configure and run bluestacksplayer”. Every time I click it, it gives me an error sound and pops back up. Very annoying. i have this also have you managed to fix it ? i am running windows 10 and tried all sorts. Tashreef Shareef plz reply me some solutions of bluestacks freeze.my pc is of HP pavilion g6 and is running on windows10. tashreef bluestacks 2 also have the game freezing problem help me out. i cannot click on the home buttons and they dont work.after i open clash of clans and it loads a little then it hangs. coc boy in which clan are u in. Error: The type initializer for ‘BlueStacks.hyperDroid.GameManager.Browser’ threw an exception. Redel, I’m having the same problem right now. Any success? The installation is successful but the apps won’t open. I have tried restarting the bluestacks but still it won’t open. How do u solve this problem? Try to restart your PC. Also disable Antivirus temporarily and see your Firewall settings. If necessary, disable it temporarily as well. hi, bluestacks was working fine in my laptop but then i installed bluestacks 2 to play vainglory the first time i installed it worrked fine i could play coc n stuffs but not vainglory then i read a post to increase the memory n so i did the redegit trick to increase ram, after that the game worked but was kinda laggy. then after sometime whan i rebooted my lappy n started bluestacks it froze everything!!! n then i had to remove the battery n i set the values to default, but still the same n then i uninstalled it n reinstalled it still same, tried reinstalling 5 times, even tried the old bluestacks but no! thats also not working. same problem with me. you got any solution? hi., so i installed it fine but it won’t load properly. it opens but then it doesn’t go any further. all i get is a loading screen and int he “android” tab except settings. Mas kalo masalah kan saya buka game Dragon Encounter terus saya klik game nya ,nah kan masuk tuh terus gak lama Ada bacaan “check hack” terus langsung keluar nah itu gimana mas cara menyelesaikan nya? Hi I am having same oroblen patching the game dragon encounter saying Alert Check Hack. any one know how to fix this? How do I hide hte multitask bar.. its really annoying when I want a fullscreen experience? I run a game clash of clans in blue stacks but after my every one or two attacks it closes the game please help me to fix it. failed to update please check your internet connection or the available free space device in the device. Hi, I installed Bluestacks2 & get The Dark Knight Rises (Gameloft) installed。While playing the game all character no shown on screen with only background & sound. My computer is Surface Pro3 i7 512G HD, 8G Ram. Kindly direct how to get it fixed. Thanks in advance! Error: Specified argument was out of the range of valid values. How i can suppose to fix that? This can be fixed using Regedit.exe, and does not require downloading anything extra. Be as it may that you are editing the registry, be cautious to only edit the files listed below and at your own risk. 2. 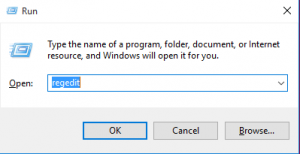 Windows 10: Press Start and Type Regedit (Older versions use ‘Run’). Start the application. This problem seems to occur when bluestacks closes, but the window width or height unexpectedly gets pulled to a size that exceeds the set display resolution of the monitor. thanks. . this help a lot man. .
You may have single handedly saved my exam…thank you. Hey my mapping keys arnt working? Anybody fixed the problem below please let me know how to fix it. thanks. Whenever I play COC in bluestacks, after 30 seconds it returns to the home page on its own, it’s annoying. What should I do? I am also having the same problem, did anyone find a solution for it? i dont know how to fix it so anyone there experience like me? Exactly the same thing for me. Worked fine, and got the instance error. I guess it’s their bug!BS2 is far better than B1, but als full of bugs! It’s like a beta, not a finished software. Hi Lilly, a user left a comment saying changing screen resolution can resolve this issue. Set your Screen resolution to the lowest possible and see if that fixes the issue. Do let me know if that works. i hav a problem while opening the bluestacks. ie it is showing that “bluestacks app player Error:parameter is not valid”. can any one help me. If you got this error, Download Bluestack Easy 3.5. Find it on google. In RegEdit tab, change Bluestacks resolution to a bit lower from your screen resolution. That’s it. Thank you, I will try it! What about: “Index was outside the bounds of the array” error? Can someone tell me why my CPU is to high (90%) when the BlueStacks is opened? I searched in different forums, but usually problem is with Chrome or malware but I did’t found anything for BlueStacks specifically. While extracting it stops on 50%, what should I do? bluestacks object reference not set to an instance…. bluestacks.hyperdroid.gamemanager.browser’ threw an exception .. how about this? .. it say somthing about object reference not set to an instance of an object.. Try changing your screen resolution to 800x 600 and see if you can run Bluestacks 2. If it runs successfully, then follow the last fix to set Bluestacks 2 Window width and height to 800 x 600.
how to fix index is out of bounds array?? Hi Alexandra, you have to disable Bluestacks auto start from the Task Manager. Right-click on the taskbar and select Task Manager. In Task Manager, click and open Startup tab. Under Startup tab, look for Bluestacks. Select it and then click on Disable. Close the Task Manager and restart your PC. This time Bluestacks will not restart automatically. The type initializer for ‘bluestacks.HyperDroid.GameManager.Browser’ threw an exception. BULESTACK 2 INSTALLED CORRECTLY AND OPEN ALSO , BUT WHEN WE CLICK ON ANDROID TAB ITS SHOWS LOADING DATA BUT NO USE AFTER WAITING FOR HOURS N HOURS. ANY ONE HELP ME OUT OF THIS? Force close any instance of Bluestacks 3 in Taskmanager tab. Disable your Anti-virus and Firewall temporarily before running Bluestacks 2. Hi there are some errors while downloading apps.can anyone help me? Was hoping you could help. I finished downloading and installing the bluestacks installer but after I press the finish button, I an error that says: “BlueStacks app player: Error, file not found.” Going through the installed files, I click some of the app startup exec files but the reply is also the same. I cannot even get into the android tab. Looking into the regedit, i dont ever find the bluestacks folder. Might be a corruption installation. Uninstall (if you can) and reinstall Bluestacks all again while keeping your Anti-virus and Firewall disabled temporarily. Hello i´ve got the same problem than Edgar, some messages appears to solve a problem and installation about .NET framework after that starts but never presents androind tab information .. just charging .. starting. . wait .. , and never starts .. always waiting after that. What happen? .. , i´m going to reinstall to try but if you can help me will apreciate. Many Thanks. when i open the blue stacks icon it is showing ‘object reference not set to an instance of an object’ what should i do? Can you Please Help me out….. Thanks for the quick reply…. Glad to hear that Phil. BTW, which fix worked for you? Please, what kind I do? My bluestacks on PC fail to open. After a longtime of running, it will the the bluestacks frontend has stopped working. Tashreef Sharif bro ! i have clean all blue stack files from my pc through registry. Still the eroor . ” Failed to Install blue stack ” appears . i had been using bluestack before but once by mistakely it was uninstalled and now it donot install . Bro plz help me !! Hi, when i click a game (Clash royale) it dont open it! I had the old version of Bluestacks, and today I got a message saying support for Bluestacks 1 would end in a few days, click here to update. I clicked and it took me to the installer page. After an install, it said, click here to open. Then an error came up. I can’t try and open bluestacks again because the frontend shortcut has gone, and I can’t find it in any of the folders. Help? Just updated to bluestacks 2. Help!? hey admin… i just installed bluestacks native 2 and when i played the parking mania game. the colour of the graphics of the game changed to blue. plz help. thank u ! I’m having the same problem. Kingdom hearts unchained X is all blue. So bad that it’s unplayable. So Clash of Clans won’t update after forced upgrade to BS2. Uninstalled Clash of Clans. Now I can’t reinstall Clash of clans. Uninstalled and reinstalled BS2, can’t install or play ANY apps now.. I had bluestacks 2. As time passed it slowed down and one day, it was not starting. I uninstalled it and deleted its files from registry, then reinstalled it but now, its running too slow , games are lagging. My graphic drive is up to date. pl fix it! Hi, I’m having a different problem. I was installing bluestacks 2 and my computer shut down abruptally in the middle of the installation. I removed everything, even the registrys. Now when I try to install again, i open the setup file and when it’s about 40% “Extracting” the installation closes. And thank you so much for helping us. You’re awesome. Hey Tashreef. I have installed bluestacks 2…….everything is fine most of the apps i installed seems working fine……but when i open CLASH OF CLANS i CANNOT SEE THE GAME THERE ARE SOME YELLOW MOVEMENTS OF THE GAME But the GRAPHiCS DOESNT SHOW UP…..PLZ HELP WAITING FOR UR REPLY……………………………. Hi Caswell, WhatsApp has released a Whatsapp application for PC itself. Try that instead of Bluestacks.. However, you should have your phone with WhatsApp activated for this to work. hey, guys i have a problem in BS 2 , when i open the apps it stucks in the loading screen . i have done every things like deleting BS 2 and again reinstall , format pc , again install older version of BS , deleting registry , install .NET frame , etc every thing i have done but also it wont . help me guys !!!! Hey, I just updated my Laptop and now when i try to use th application blue stacks it does not open. I was directed to email Bluestacks what can i do? Bluestacks support hardly gets back to anyone. You can try reinstall of Bluestacks. Also try to install the Offline version of bluestacks 2. I get the “Error: Specified Argument was out of the range of valid values. Parameter name: MinimumSize” Problem and changing the resolution doesn’t work. Any suggestions? Hi I installed this properly and every time I try to install a app I get (Error retrieving information from server) [DF-DLA-15]. No matter what app it is. Help?? I am also getting this error. after downloading data…my bluestack stuck on initializing.. Try disabling your firewall and Anti-virus temporarily and then start Bluestacks. See if that works. my map keys are not working on game of war, i do not have a touch screen so i cant use that option, is there any way i can fix this? After downloading an app and trying to open it, the tab for the game opens. But it stays black for a moment, before taking me back to the previous tab and closing the game tab. So I can’t open the app. I have to updated version, and I tried to download the APK to help but it didn’t help. Uninstalled and reinstalled Bluestacks and nothing helps. Did the same for the game. Same thing. The problem i’m having is that my pc shuts down unexpectedly while watching movies with Play View via BlueStacks2. No warnings or dialog box or anything, it simply begins shutdown without warning. Any ideas on how to prevent this from happening?? Driving nuts! Windows 10 Home ed./ GeForce 8400GS display adapter/ Intel Celeron D 3.33GHz CPU/ 32-bit OS, x64-based processor. thanks alot!! my bluesstacks is working now!! THANKS somuch!! I have a problem that in clash of clans any reference is not set properly . So plz help me . Hi! I installed the new BS. My problem is that, I installed The Simpsons Tapped Out, and played once. But now if I click on it, it starts loading, says Tap anywhere, and than it is loading a little bit more as usual, but than it not starts the game, but shuts down, like if I would click on the X. What should I do? Permission Error: Unable to unpack native libraries due to insufficient permissions. I’m trying to play Vainglory on bluestacks with a nextbook 10.1. I already edited the registry to fix an issue where bluestacks was in landscape when the device was in portrait and vice versa. Now some of the controls for this game arent responding. Movement, specifically. Specific in-game buttons work fine, but taps on the fiels don’t register properly for some reason. Have you ever heard of something similar? Does anyone have any idea how to resolve this? tashreef, dr duks probloem is my p0roblem and u didnt answer or give any suggested solutions…hope its ohkay. I can not play clash of clan on pc android apps like bluestacks, andy.. it just shows downloading contents and then reload it several times, but given results are same. when i download clash of clan and again install it shows same problem. so, How I solve this problem and play clash of clan on my pc android apps(bluestacks/Andy)..?? in the last version “that is nessecery to update” , the royal clash never played at tablet size . and in normal size the game screen still horizintal so playing become from right to left insted from down to up relative to screen forthat i must rotate the all laptop and it’s imposiple to do . I have a serious problem with Bluestack 2 when restoring my village in Clash Of Calns. I have tried all attempts mentioned on the internet to connect to (Google play games) to restore my village, but all attempts failed. There should be an update to fix this bloody problem. Bro I have a problem of Bluestacks. I am unable to uninstall BlueStacks App Player. Error is `The application was unable to start correctly (0xc000007b). Click OK to close the application.’ Can you solve this problem please? It’s urgent for me. Please help me today. I have a problem of a glitch I think that wasn’t here. All it says whenever I click bluestacks is: ” Error: Assets/tab_close.png”. Hi,my blusetack stack at initializing affter the PC hang a few times.Tried uninstalling and reinstalling, worked at first but after transfering data into bluestack folder it gets stack at initializing again.please advice. Hi sir, I receive this error while opening bluestacks: system access violation error. It says that it cannot access the memory. What can I do? Same problem…have u solved it? I installed bluestacks 2 and it worked well even installed instagram however it crashed midway and i had to swicth off my copmuter now everytime I try to run bluestacks it keeps freezing my computer screen and nothing works till I have to switch it off again. please help. Hi, Advela, if the Bluestacks is freezing while being started, try disabling your Anti-Virus and Firewall temporarily. 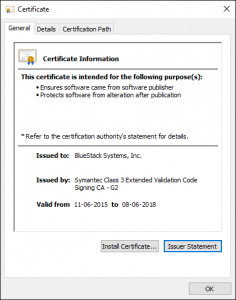 Bluestack installation error <microinstallernative.exe. file name not found. i run bluestack2 for about 6 months now, run perfectly for my game (Clash Royale, Boom Beach, etc), though it slow on loading & my CPU run around 60-70% while finishing loading in around 7 minutes. After a few hour, it always got stuck & have to restart plugin and sometimes said the bluestack cannot restart. Then i know by exp, teminate bluestack.exe & HD-Plus Service.exe will let me start bluestack. My problem now is bluestack stop loading & stuck on 20% on my memory (should be around 60% at least before i can run anything) & not increasing for 15″, then i check my task manager & see that HD-Plus Service.exe is not running. I try a few times restarting bluestack, reboot, etc but it still stuck without any error message. I run a game in blue stacks but after my every 10 min playing it closes the game please help me to fix it. What is your PC configuration? Hi! After I open BlueStacks, it says ” Some error occurred. Please try again”. What should I do? Hi, did you try disabling the Antivirus temporarily? I am getting the same error: Some error occured. Please try again. But, this needs to be done with every Bluestacks startup. Did you manage to find any permanent fixes? I am having same issue, and tried disabling antivirus but not working. Someone has another idea ? I have a problem for using Whatapps in bluestack, as it crash automatically when open the apps. my bluestacks is not working after the update.when it opens show sign in to google and if try to sign in there will be a white page. my graphics card is low 256 mb i install bluesticks2 native but didnot start clash of clans and when it come i didnot seen any thing on its screen. so what will i do?